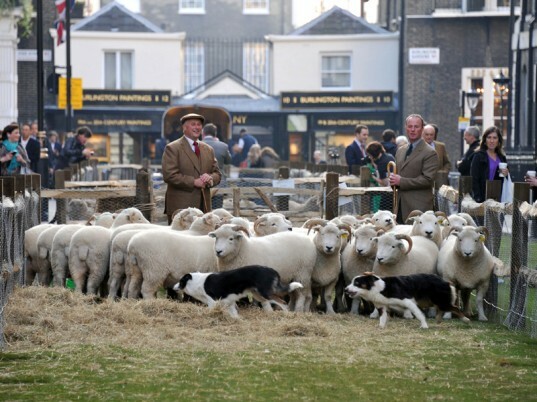 A flock of yellow sheep milled outside London’s Oxford Street on Monday, while a similar woolly conflagration grazed along the city’s venerable Savile Row. Revenge of the herds? Not quite. The free-range ruminants were all in the name of Wool Week, a fiber-feting event organized by Prince Charles’ Campaign for Wool. For the next seven days (give or take), roughly 400 retailers and 68 fashion houses across the United Kingdom will be extolling the virtues of British wool, including including tony labels like Burberrry, Pringle of Scotland, and Jaeger. 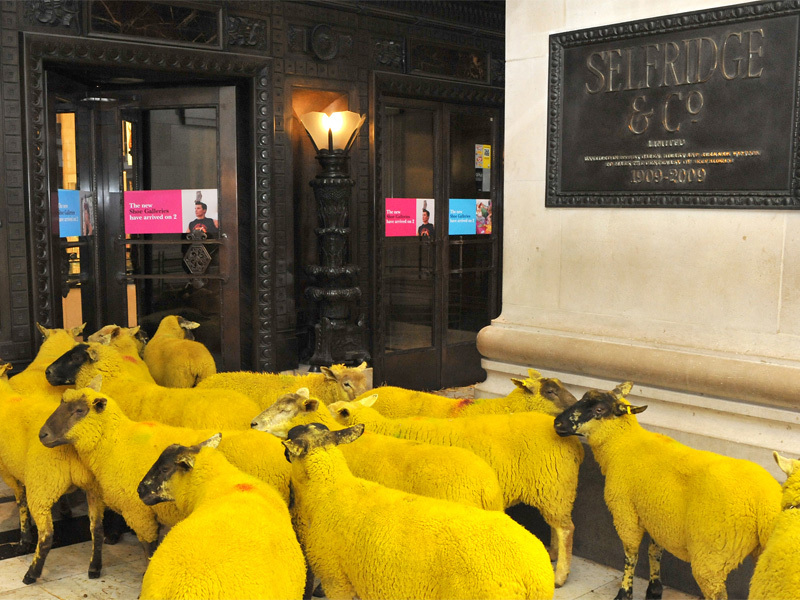 Selfridges arranged to have 15 saffron-hued sheep painted in “Selfridges yellow,” using nontoxic vegetable dyes. On the department store’s third floor, customers are invited to help create a knitted house with yarn donated by Rowan and Coats & Clark. Downstairs at Pedlars, you can pay for—and snip off—any length of a colorful, striped “scarf on a roll,” made from 100 percent Scottish wool. Selfridges arranged to have 15 saffron-hued sheep painted in “Selfridges yellow” using vegetable dyes. The Campaign for Wool, which launched in January, aims to boost the profile of a flagging industry. “A couple of years ago, I was shocked to discover that it often costs more the shear a sheep than a farmer would be paid for its wool,” said Prince Charles in a video message on opening night. The scheme, which markets the fiber as a fashionable, durable, and ecologically friendly alternative to disposable fashion, is working to promote the desirability of wool, from clothing to carpeting. Wool isn’t without its detractors, however. Both shearing and a deliberate act of mutilation known as mulesing (to prevent maggot infestation) have been criticized by animal-rights activists as cruel and barbaric. Wool is cruel. http://www.vegansociety.com/resources/animals/sheep-and-wool.aspx Unless you shear your own sheep or know someone who does, this is likely the reality of where your wool comes from. Was just coming here to say that even if wool isn't cruel, setting farm animals (even corporate farm animals) loose in an urban setting has to be crazy stressful for them! A flock of yellow sheep milled outside London's Oxford Street on Monday, while a similar woolly conflagration grazed along the city's venerable Savile Row. Revenge of the herds? Not quite. The free-range ruminants were all in the name of Wool Week, a fiber-feting event organized by Prince Charles' Campaign for Wool. For the next seven days (give or take), roughly 400 retailers and 68 fashion houses across the United Kingdom will be extolling the virtues of British wool, including including tony labels like Burberrry, Pringle of Scotland, and Jaeger.